Since I was about 19 years old I have been rocking the single bed – in fact it is the same bed I had in college – my grandparents bought it for me in my second year when I moved into an apartment. For 11 years I’ve slept on this narrow bed, which as of late has grown uncomfortable with its springs that have now become sprung. Yet, financial issues aside, I can’t bring myself to upgrade just yet. It’s not a form of nostalgic attachment to some lost love, or a gift from my grandparents. 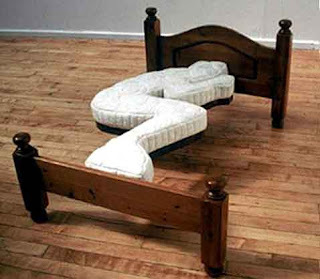 It just seems to suit me, single bed, single me. I’ve taken quite the ribbing from many people when they find out that I still have a single bed. Friends usually shake their head and tell me it’s time for me to buy a ‘Big Boy Bed’ or ask “How can you even bring a girl home?” or some variation of that question. Although sleeping can sometimes be difficult, I like the closeness my single bed affords, and the limited space has also been know to inspire creativity wink-wink, nudge-nudge.